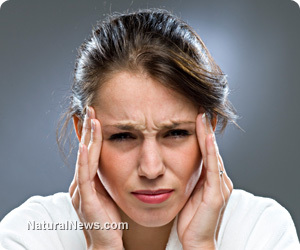 (NaturalNews) Although migraines usually involve severe headaches, migraine attacks are not just headaches. There are two basic types of migraines: With aura and without aura. Both types often produce symptoms of nausea, vomiting, and extreme sensitivity to light and noise. The environmental circumstances that cause migraines are called triggers. They can be chemical fumes, glare, strobe-like intermittent lighting, fluorescent lighting, certain processed foods, MSG, aspartame, sudden weather or barometric (air pressure) changes, and even menstrual cycles. The Neurology Department of Erciyes University in Kayseri, Turkey conducted a double-blind randomized placebo study using 40 migraine without aura or common migraine sufferers to determine the prophylaxis (preventative) effects of magnesium supplementation. Prior to this study, magnesium study results were mixed and sometimes disputed. Also, those other studies did not focus on migraine without aura sufferers. This one did. The migraine sufferers were aged 20 to 55, and they experienced two to five attacks per month. Of those 40 patients, 30 were given a daily dosage of 600 mg magnesium citrate, a well absorbed form of magnesium, while the other 10 were given placebos, which this writer considers cruelty for the sake of science-based evidence. The trial period for both groups was three months. Post-treatment analysis determined that those who received magnesium citrate experienced migraine attacks significantly less often, less severe, and with less intensity than the placebo-controlled group. The research team concluded: "These results have made us think that magnesium is a beneficial agent in prophylaxis of migraine without aura and might work with both vascular and neurogenic mechanisms." Calcium supplementation is over emphasized and overdone. It's even been discovered to be dangerous. Meanwhile, most media health channels ignore magnesium, from which a vast majority of the population is deficient. This deficiency is mostly due to Big Ag's topsoil depletion and the processed food standard American diet (SAD). Yet, magnesium is considered the master mineral. It is involved with over 300 cellular metabolic processes. It affects our nervous system, muscle tissue, and heart health. Unfortunately, what many consider a good healthy diet may still not offer sufficient magnesium for optimum health. Greens and whole grains are good food sources of magnesium, but they may not provide sufficient magnesium because of general topsoil depletion. Many oral magnesium supplements are not readily absorbed into our blood and tissues through the digestive system. Transdermal patches, soaking in water with Epsom Salt (magnesium sulfate), or topically applying magnesium chloride AKA "magnesium oil" are effective solutions that completely bypass the digestive system for direct absorption into the blood stream. But oral magnesium citrate, used in the Turkish study, is assimilated fairly well. There are some magnesium supplement powders, often including the word "calm" on their labels, that create a highly assimilable fizzy liquid when hot water is added (http://www.naturalnews.com).